Severed fingers. Calves sliced open by discarded glass. Smashed-open skulls. Workers crushed to death beneath heavy and unsecured containers. And a swirling history of organized crime. These are but some of the horrors that face the employees of private New York City waste collection companies, brought to light by an incredible story from ProPublica. 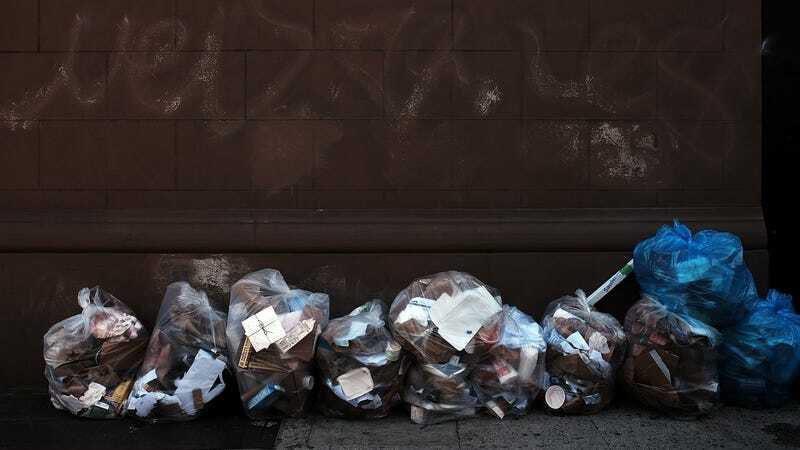 If you ever walk through New York City and feel like you are stepping through trash (as I often feel), then you really aren’t that far off the mark: New York City creates 33 million tons of waste per year. During the day, the New York Department of Sanitation picks all the trash up from New York City’s residents. But at night, the private waste removal services come out for the trash generated by the city’s businesses. And that’s a whole different world. Unlike working for DSNY, private waste collectors and truck drivers aren’t afforded luxuries like days off, health insurance or overtime pay, according to ProPublica. The “union” that’s supposed to be protecting them appears to be working instead mainly for the businesses that employ them. The story follows a garbage truck driver named Alex Caban on a hot night in July, 2016. Swinging a bag like a baseball bat will risk spraying garbage juice in your partner’s eyes or mouth. Hold the bag away from your body to avoid gashes from glass. For lighter bags, use a down-and-up-and-over torso twist-swing. For heavier ones, over 70 or 80 pounds, do a full 360-degree spin-and-drag move, not unlike an Olympic hammer throw, using the weight of the bag to gain momentum. In addition to the story, ProPublica also created this awesome graphic that gives an accelerated view of Caban’s route. At around 7:30 p.m., Caban started his shift. He went to pick up the truck and set off on his route, which took him zig-zagging through Brooklyn and eventually up and down Manhattan. At around 3 a.m., Caban was finished, having made approximately 500 stops across the city. And that was just a half-shift. simply handed their companies over to their wives or sons, who continued in the industry. Being related to someone on the debarment list is not grounds for the denial of a Business Integrity Commission license. It’s utterly fascinating stuff, one of those stories that really illuminates an industry people only pay attention to when it stops working or malfunctions.